This page deals with the EMFs from Smart Meters, like the US example shown in the top picture and the UK example in the bottom picture. See also the EMFs from traditional rotating-disc meters. 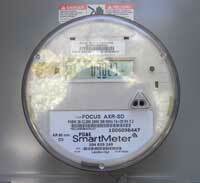 We use the term "Smart Meter" loosely here. Much of this also applies to different variants of Automatic Meter Reading - meters that transmit the meter reading but without the full Smart Meter functionality. And it's possible to have Smart Meters that don't use wireless technology at all, if they transmit data over the power lines for example. Smart Meters produce very low power-frequency EMFs. But most of them communicate by wireless technology, which involves radio-frequency (RF) EMFs. RF EMFs are generally outside the scope of this website, which deals with power frequencies. But because Smart Meters are part of the electricity system, we give some basic information on the RF fields they produce here. What technologies do smart meters use? Smart Meters communicate both outside and inside the home. Outside the home - the Wide Area Network or WAN - they communicate information on meter readings to the electricity company, and information on tariffs etc back the other way. Inside the home - the Local Area Network, LAN, or Home Area Network, HAN - they are equipped to send information on consumption to a display within the home, and to communicate with "smart appliances" when these become available. In many Smart Meters, both of these use wireless technologies. Some Smart Meters use the existing mobile-phone systems, where each Smart Meter contains the transmitting bit of a mobile phone, and communicates with the nearest base station when it needs to. Others use a radio signal to send information to a collecting point, which collects the information for a few thousand or tens of thousand homes and sends it to the electricity company. These systems do not actually use mobile phones or mobile-phone base stations, but because the communication requirements are similar, they use fairly similar frequencies (hundreds of MHz) and powers (up to perhaps 1 W) to mobile phones. Still others use a "mesh" system, where information is sent from one Smart Meter to another, and the information is only sent to the electricity company (either from one particular Smart Meter or from a separate data aggregation point) once for every few hundred homes. That radio signal is usually around 900 MHz, close to the frequency of many mobile phones, with a maximum power of 1 W, though as the range required from one meter to the next is lower, the power may be lower. Other systems are also possible, using satellites, power line communications or fibre optics. Inside the home, Smart Meters usually use wireless signals at 2.4 GHz, with a maximum power of less than 1 W. This is a similar frequency to several existing wireless technologies - WiFi, Bluetooth and ZigBee for example. Some Smart Meters use the actual ZigBee system, and powers may be significantly less than 1 W.
How often do they transmit? Smart Meters typically send bursts of data, lasting a fraction of a second, at intervals of minutes or hours. Lots of different figures are quoted for the overall fraction of time Smart Meters transmit for - the duty cycle - and this is partly because meters are used in different ways by different utilities. Figures of less than 1%, or even 0.1% or 0.01%, have been found in many situations, and it seems safe to assume that virtually all Smart Meters stay below 5%. As smart grids are developed, it seems likely communication with individual meters will be more frequent and duty cycles will increase. But much of this would be for extra services which were at the customer's choice. Some remote reading meters don't send data to a central point, instead they send out information continuously every second or two, to enable the signal to be picked up by meter-reading equipment when driving along the street. But a typical data-transmitting pulse would be 6 ms long, still giving a duty cycle of less than 1%. A 1 W radio transmitter basically produces the same radio frequency signal strength no matter whether it is being used for a mobile phone, a smart meter, or any other technology. A person's exposure from it will depend on the actual power, how close they get to it, and (for average exposure) the duty cycle, that is, how often it actually transmits for. RF EMFs are often characterised by the power density rather than by the strength of the electric or magnetic field. The following table gives some typical values for various situations. "The evidence to date suggests exposures to the radio waves produced by smart meters do not pose a risk to health. Assessments made in other countries that use smart meters have found exposures that are low in relation to internationally agreed guidelines. HPA will be carrying out research to assess exposures from the devices as the technology is rolled out. HPA considers exposure to radio waves does not provide a basis to decline having a smart meter."